Materials requirements planning is not new in concept. Logic dictates that the Romans probably used it in their construction projects. the Venetians in their shipbuilding, and the Chinese in building the Great Wall. Building contractors always have been forced into planning for material to be delivered when needed and not before. because of space limitations. What is new is the larger scale and the more rapid changes that can be made through the use of computers. Now firms that produce many products involving thousands of parts and materials can take advantage of MRP. Order with the right due date. Plan for a complete load. Plan for an adequate time to view future load. The theme of MRP is "getting the right materials to the right place at the right time. The objectives of inventory management under an MRP system are to improve customer service, minimize inventory investment. and maximize production operating efficiency. The philosophy of materials requirements planning is that material hould be expedited (hurried) when their lack would delay the overall production schedule and expedited (delayed) when the schedule falls behind and postpones their need. Traditionally, and perhaps still typically, when an order is behind schedule, significant effort is spent trying to get it back on schedule. However, the opposite is not always true; when an order, for whatever reason, has its completion date delayed, the appropriate adjustments are not made in the schedule. 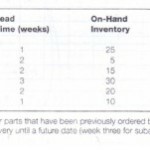 This results in a one-sided effort-late orders are expedited, but early orders are not de-expedited or delayed. Aside from perhaps using scarce capacity, it is preferable not to have raw materials and work in process before they are actually needed, because inventories tie up capital, clutter up stockrooms, delay the introduction of design changes, and prevent the cancellation or delay of existing orders.